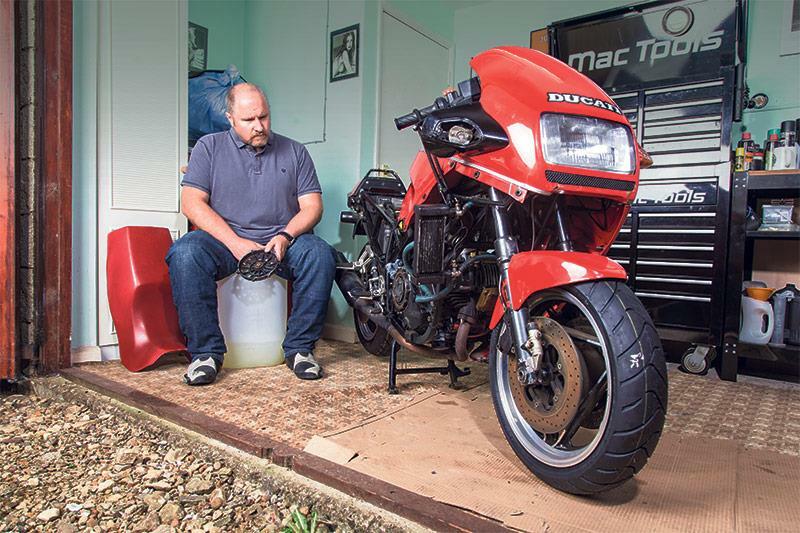 It always felt like a fantasy; trying to revive MCN’s long-neglected and badly battered Paso 750 to go head-to-head against a superbly tidy K1 on an aspirational 1700-mile run to the Bol d’Or. The mountain we had to climb looked no less daunting than the Alps that we planned to traverse, and the closer we got to our leaving date, the more farcical it looked. s the MoT tester shook his head and declared the Paso unfit just hours before the off, the dream vanished into the ether. But France still beckoned, and the Magny-Cours round of the World Superbike championship seemed tempting until the weather forecast made it look more like a trip for jetskis than two aging plastic boats. We wanted a run to the sun, to head south and revel in the warmth of the dying days of summer, not to be the last witnesses to France being reclaimed by the sea. Basking in a domestic mini-heatwave seemed to answer the destination question for us, and the third target in as many weeks was settled on as the most southerly point in the UK – The Lizard, Cornwall. If we could coax our bikes there and back, it would be a journey that’d see us nudging 750 miles of motorway slog and sublime back roads, beautiful scenery and not a toll road or onion in sight. A fair test by anyone’s measure. RN: Click. Nothing. Click. Nothing. Click, click, boom. The Paso’s starting regime has done more damage to my nervous system than any other bike in history. Its derisory refusal to dump a healthy kick of electricity to the starter without a couple of fruitless strokes of the start button will probably result in a proper breakdown one day. But not today. The Lizard feels ominously distant though as I nudge the Paso’s nose out the end of my drive for a short hop to Oundle Mill, where I’m meeting Andy and his pristine K1. I bet that started without any such dramas. I’m feeling my way with the 750, every metre of motion feels alien after so few miles together. It bounces and clatters along bumpy back roads, but feels torquey and responsive as cart-track bumpiness gives way to the gracefully sweeping Benefield Bends and the fast road down into Oundle. This feels alright, and it sounds even better. As I approach the Mill I can see Andy beaming next to his Beemer, but I can’t work out if he’s happy that I’ve made it, or just amused by the likelihood that I probably won’t get much further. AD: I have to admit to feeling slightly apprehensive about this trip; but massively less so than I was when the plan had been to substitute the Bol d’Or for Magny-Cours. The thought of either bike (but let’s face it, it was more likely to be the Paso) expiring on a French Autoroute and then spending days faffing and fuming as our legs were lifted repeatedly by official rescuers was not sitting well with my organisational OCD. Heading off for the scheduled meeting point felt easy by comparison. My only hiccup is at my local Shell station where, for the first time in 15 years, the staff insist I remove my flip-up helmet. Which was flipped up. So I ride off and find fuel elsewhere. I still arrive first and wait for the sound of an approaching Ducati, then try not to look surprised when the Paso sweeps into view. RN: After a liberal dose of self-deprecating ‘I’m going to break down before you do’ banter, we swallow our nerves, thumb starters, and head for the A43. It’s hilarious following the K1, I can slipstream it from three miles back. Towns and villages pass beneath our wheels with surprising regularity, and before we know it we’re at Oxford, taking the A420 exit for Swindon. A pair of superbike-mounted riders wait at the traffic-lights ahead, and their double-take as we pull up behind them drags an audible chortle from my belly. We must look spectacular. We scythe past them on the long left-hander up onto the 420, and they never get back past. Are we really that wide? 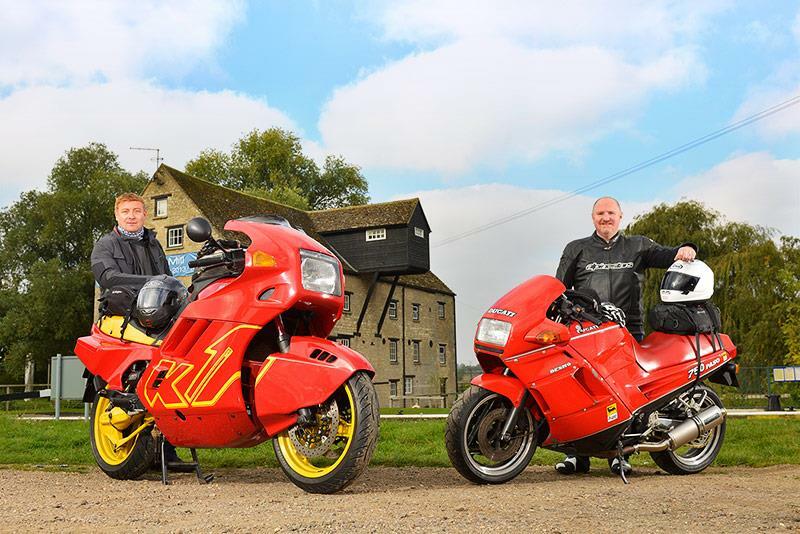 Swindon passes without inspiring us to stop, and we drop onto the M4, before pulling in at Leigh Delamere for lunch and what would prove to be the first of many chats with agog MCN readers, all shocked to see us on the road. Stuffed to the gunnels we crack on, peeling off again at junction 18 and snaking down the hill into Bath. The desire to soak up the city and see old friends (I used to live there) is countered by the increasingly ineffectual results from squeezing the Paso’s clutch lever. My Double Whopper keeps rising in my throat as every junction approaches. The clutch is grinding, the lever pulsing in my hand, and the green neutral light refuses to make a showing as the heat builds and the gearbox gets more cantankerous. I’m playing chicken with my own resolve, unsure if the Paso will fail here, or if my bravery to keep pushing on will falter first. Junctions and roundabouts become a gap-jumping game, working hard to avoid coming to a dead stop. AD: I don’t know this area one little bit. My last visit to Cheddar Gorge was in the back of the family car in the mid-1980s, so I am forced to follow Rich. As soon as we get off the faster roads I am confronted with two rather unpleasant sides of our bikes. 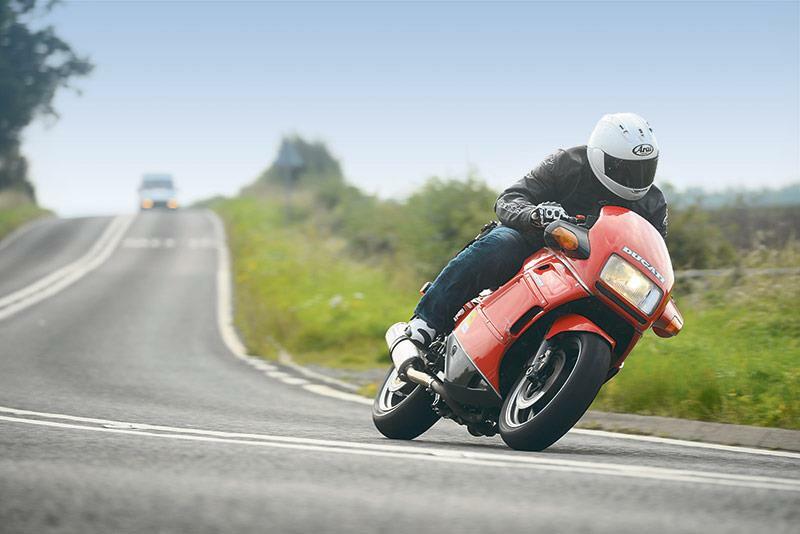 My K1 is pretty happy on the motorway, but get into any kind of traffic and the heat from that laid-over 1000cc four-cylinder motor starts to build. Heat radiates up over my lower legs, and then a little while later arrives the heat soak through the steel frame, aluminium fuel tank and even the bodywork. It’s not nice, and I am constantly checking the temperature gauge to reassure myself that the big old girl isn’t about to turn into a kettle and boil over. The relief when the cooling fan cuts in is huge. Following the Paso is nasty. I’m inhaling the acrid fumes of partially burnt gasoline, which are just an aperitif to the main course of burnt oil that’s seeped around its piston rings on the overrun. I’m gagging. I can see Rich is struggling with the clutch at junctions, and I assume that we are going to be stopping on the outskirts of Bath while we wait for recovery. But just as I start to think we’ve gone as far as we’re going to get we clear the city and the cooling rush of airflow gives me some hope of salvation. 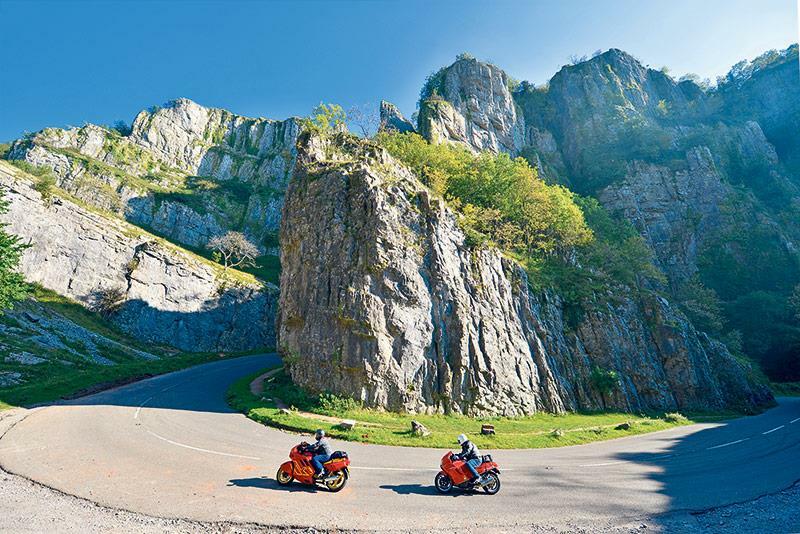 RN: As we drop down into Cheddar Gorge I get the feeling that we’ve slipped though biking’s Narnia doorway, and ended up in the Mediterranean. England has rarely looked this sunny, or visually dramatic. It’s a stunning slash in the Earth’s crust. Leaving the Gorge, we stop for fuel before snaking out onto the M5 in search of fast miles and a cooling breeze. Exeter sails past, and we arc through the awesome right-hander onto the A30, powering West. After a 10 -minute leg-stretching break at Whiddon Down services, we look at a map and the dipping sun, and decide that there’s little point heading towards The Lizard. I know Cornwall’s north coast well, and picking somewhere familiar to collapse for the night seems preferable to blindly trawling the streets of Truro for a hotel and a bite to eat. So we drop off the A30 at the A395 and cut across to the A39, revelling in the fast smooth and sinuous roads down to Padstow and the Old Ship Hotel, where a fish and chip supper beckons. Looking over the old town and down to the harbour feels surreal. I never imagined we’d get this far when I woke up this morning. We’re just 53 miles from the Lizard, and providing the Paso starts in the morning, we’re going to make it. AD: A decent night’s sleep and breakfast behind us and we head out to the hotel car park muttering the usual little prayer that the bikes are still where we left them. Unshackled from their multiple locks, I roll the K1 off its centre-stand and climb aboard, twist the choke lever, pull in the clutch to give the starter motor an easier time, and thumb the button. Precisely one- and-a-half seconds later the BMW is running smoothly on full choke with a cloud of steam burning off the condensation from the large exhaust. As I settle onto the bike I realise I forgot to wipe the heavy dew from the seat, and now it’s soaking into my pants. The Paso is singing a somewhat alternative dawn chorus. It’s like listening to a 60-a-day smoker’s morning chest rattle-morph into a death-defying coughing fit as they try to get out of bed. It doesn’t sound good. And then there’s silence as some unseen electrical system loses whatever piss-poor connection it had. And then the death-rattle is back as one cylinder fires into life. Then another, and then a misfire, before it settles into a lumpy, bumpy, grumpy idle. For a second there I thought it was journey’s end. It’s off to The Lizard we go. Last time I was there it was so windy it was too dangerous to go anywhere near the cliff edge for fear of an unscheduled swim. Today’s weather looks more positive. Cornish roads are deceptive. You look at a map and your brain under-calculates the time it will take by about 50%. I guess it’s the combination of nadgery back roads, caravans, tourists, tractors, caravans, more tourists, more caravans and then having to paddle backwards to a passing point to allow cars to get through that contributes to such slow journey times. RN: The narrow track and dry stone walls are making me nervous. We’ve already squeezed past two cars, fortuitously close to passing points, but the Paso’s clutch is suffering from the traffic light and roundabout dance through Truro. The chill of a misty morning has succumbed to baking sunshine, and as the Paso spits me out onto the headland, there’s nothing but sea stretching out towards France. Suddenly it’s not the clutch that’s worrying me, it’s the Paso’s uninspiring braking performance. But as we crawl to a controlled stop at the cliff top I kill the ignition and revel in the stunning view. Not even the thought of our impending 340-mile return leg can dim the elation. 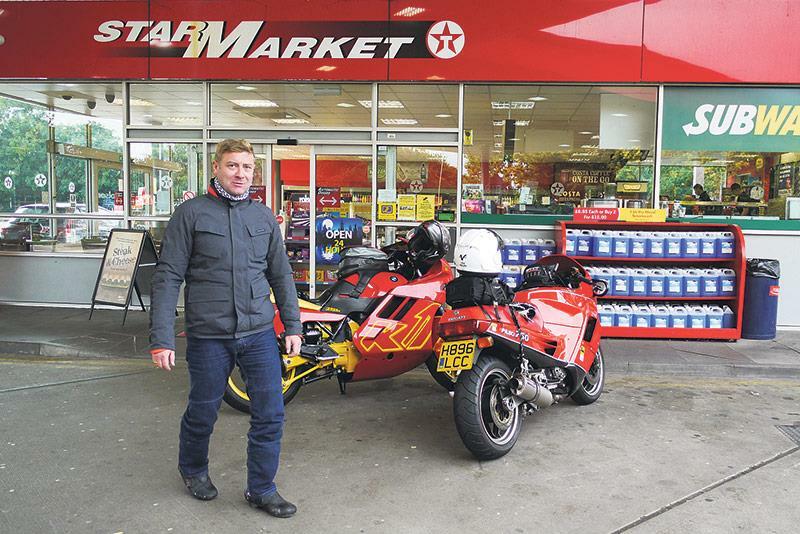 Andy parks alongside and we share a handshake and mutual congratulations laced with mild expletives as relief mixes with tangible pride in our aging bikes. Time for celebratory tea. AD: We’ve made it. Both of us. Together. And no hint of needing a breakdown service or a tow-rope. I am genuinely elated and slightly delirious. The view is magnificent and its 22ºC, dead calm, sunny and the views stretch for miles. As Saturday mornings go, this one is proving to be pretty bloody decent. With a couple of cups of tea firing our synapses we get to press the best button on our satnavs – ‘Home’. My lungs can’t take any more of the Paso’s emissions, so I make a charge for the lead, and make the mental adjustment to our 340-mile horizon. We’re going home, and I want to get there in time to sink a few beers before England square up to Australia at Twickenham. RN: As we exit the A30 services at Okehampton the Paso starts to feel hesitant on the throttle. My brain starts inventing conspiracy theories. Had we let the fuel get too low and it’s dragged some filth into the carbs? Are the coils or ignition giving out? Does the oil light work, maybe it’s running dry? Did I put diesel in the tank? I pat the Cagiva elephant on the Paso’s tank decal and ask it nicely to carry me home. It clears its throat and we’re cruising again. In a rare bit of superstitious lunacy I decide to tell it every time we cross a county border, and give it mileage updates every 50 miles. It’s a solitary dialogue that I maintain all the way home. Yes, home – 721 miles after leaving 31 hours earlier. We made it. It seemed like fate. I’ve always had a soft spot for the eccentric Paso, and enjoy hours in the workshop almost as much as I love riding. 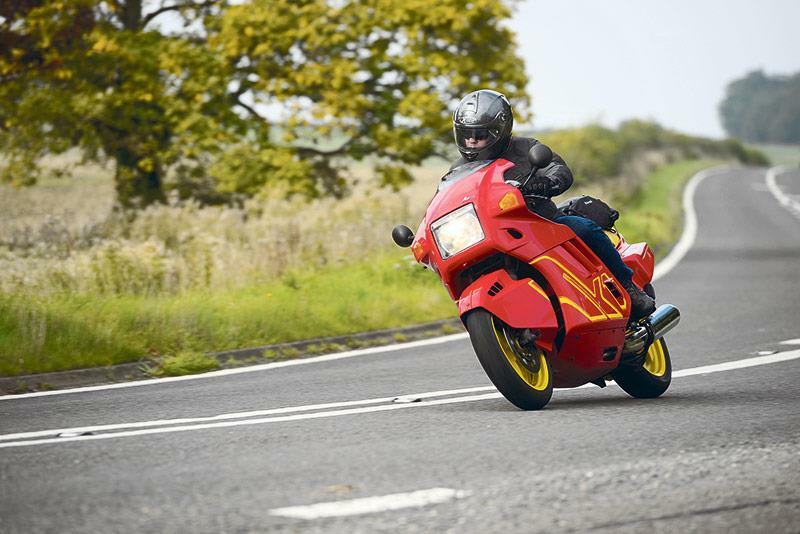 So when MCN’s lock-up surrendered a needy Paso 750 into the light, I was hooked. What followed – having arrogantly proclaimed that I’d fix it and ride it to the Bol – was four months of late nights, lost weekends, and hours of internet trawling for parts and knowledge in an attempt to live up to my promise. I failed. The hours evaporated as knackered parts succumbed to the bin. Ancient granite-like Michelins made way for the only OE fitment available, from Korean firm Shinko, and you know what – they’re ok. Bent and holed exhausts made way for Hawk Racing cans and link pipes, the leaking shock was replaced with a superb Hagon unit, all brake and clutch lines got the HEL treatment, Ducati clutch plates replaced the bucket of rust that was there, while new belts were joined by a box- load of service items from Wemoto to refresh the engine, fuel system, brakes, chain and sprockets. The big failure proved to be the fork, but as the Paso wasn’t rideable at the start of the project, we only discovered that at the end. The right fork leg was missing a significant spacer from its internal inventory, turning the spring and its sheathing tube into a slide hammer inside the stanchion. Time lost fixing it meant that I never got round to painting the black right-hand mirror unit. Now, it feels like an identifying mark, like a uniformly coloured dog with one black ear. I might even leave it like that. 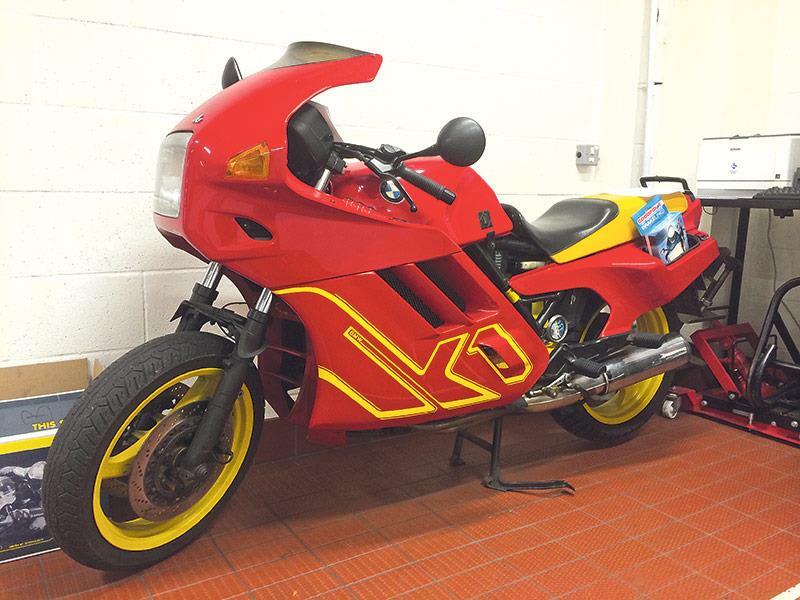 My love of the BMW K1 can be traced back to a daytrip to London as a teenager, and seeing a red and yellow one parked at Park Lane BMW. Finding one in 2014 was tougher than I thought but this one seemed like a good proposition having been in the ownership of one man since new. It ran but had barely moved in six years and needed some fairly extensive work by Peterborough’s Balderston BMW to get it back on the road. Pretty much everything rubber needed replacing. That included much of the fuel and coolant system, brake lines and the ancient Michelin A59 front and Macadam rear tyre looked like they were going to need explosives to remove. The water pump gasket was replaced, various historical BMW technical updates were carried out too. It took weeks and cost a fair bit but the bike has been working perfectly ever since. The brake discs were replaced by upgraded Brembo Oro versions with matching pads. The calipers needed rebuilding, the front brake master cylinder was leaking and needed replacing, Goodridge built new braided hoses for the ABS-equipped bike, Metzeler Z8 Interact tyres are available in the 18in rear fitment and are brilliant. My prep for our trip included the fitting of a Garmin Zumo 590LM satnav, a Kriega US30 tailpack. The original K1 tankbag supplied with the bike was absolutely brilliant and still works perfectly. Oh, and I polished the bike and because the porous old alloy wheels seep air, I did have to pump up the tyres, too. By every objective measure the K1 and I have won this contest. Let’s be honest, it’s a better bike, better designed, better built, more reliable, faster, better handling, it’s got fully-functioning ABS, heated grips, starts on the button every time, and doesn’t smoke like a coal-fired power station in traffic. If it wasn’t for the dread of spending a week getting home from a Paso-induced breakdown on a French motorway, I’m confident the K1 would have made the Bol d’Or without fuss or drama. Perhaps next year. By every objective measure, the K1 wins. But even I have a sneaking admiration for the rattly, tatty, smoky and untidy Paso. I am staggered it made it without a total meltdown. Ok, I can’t argue that Andy’s K1 isn’t the better bike, objectively, but I’m still claiming victory. 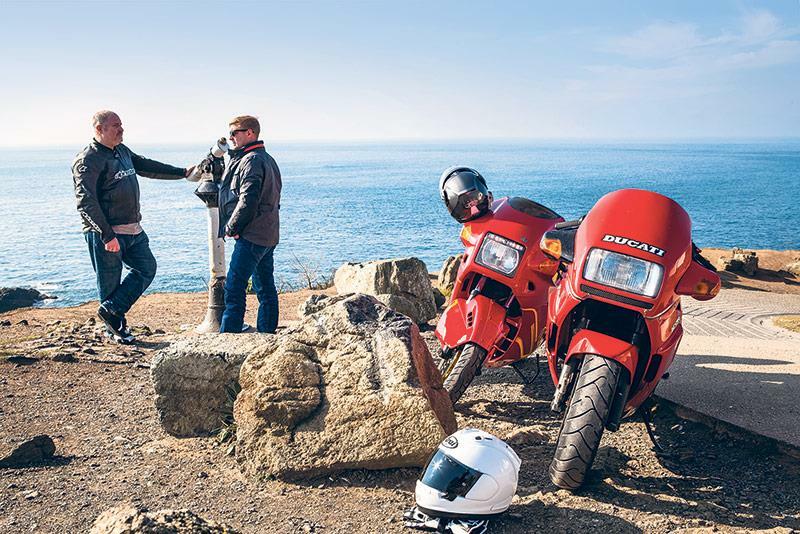 The Paso was bought as a £400 wreck, but with a lot of tinkering and £1250 of parts and labour it came out of a 12-year crash-induced hibernation to nail a 1000-mile week without complaint – or failures. It now even starts on the first stab of the starter more often than not. Tatty as it is, it looks great, sounds thunderously sonorous, gets attention everywhere it goes, and is one of the most comfortable bikes I’ve ever done a 400-mile stint on. Yes it requires care and cajoling, but it’s seeped into my affections as inexorably as the whiff of its exhaust emissions have to Andy’s nostrils. What a bike. I win. Definitely.